The myth of Wu Tao-tzu tells of a Tang dynasty painter who was one day looking at a mural he had just completed. He clapped his hands and the temple gate in the mural opened. He entered the gate and the painting vanished from the wall. Wu Tao-tzu was never seen again. But he has returned to the imagination of many contemporary artists who, troubled by our age of instant gratification and tossed in a sea of near two billion Chinese clamouring for a house and car, are pondering more than ever the nature of man’s infinite longing for that elusive, other home. Mao Yan, the renowned master of Chinese Neo-Realism, and his protégé Fang Kai, have heeded that longing and through the power of their portraiture kept that spiritual or artistic hope alive. 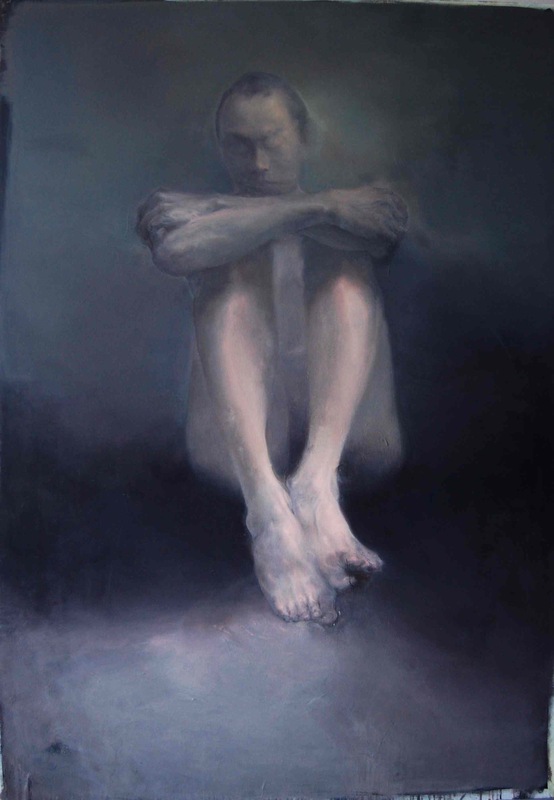 Looking into one of Fang Kai’s portraits is like looking at a ghost in limbo. Some have surrendered to waiting (Portrait of MK), some gaze in awe of what is to come (Night Light Man) while others, perhaps having waited for too long, have turned hostile, a little impetuous even (Seated Man 1) at the silence of their watcher. Fang Kai masterfully employs his own blend of chiaroscuro, a method of dramatically lighting dark subjects by a restricted and often unseen source. Literally “light-dark”, chiaroscuro was defined by the Italian Renaissance masters, favoured by portrait painters of bygone epochs, notably the Dutch, and often used to paint religious scenes lit by a single candle or the divine light from the infant Christ. Modern man has since grown very suspicious of anything existing outside his own mind, let alone a divine light. But by drawing the solitary figures out of their vast shadows with a cold, crystalline light, Fang Kai seems to be teasing not only the soul out of its shell, but modern man out of his subjective cave.